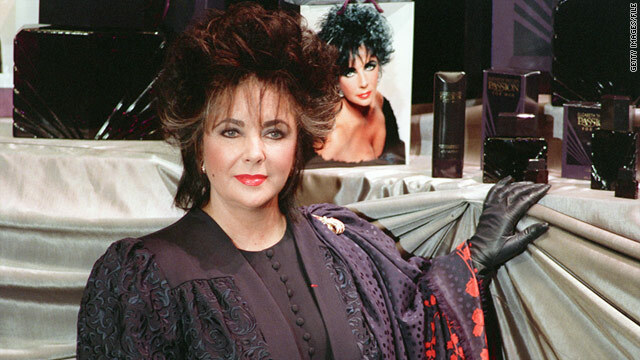 Elizabeth Taylor debuted Passion for Men in Paris in 1989. (CNN) -- Long before there was the House of Gaga, there was the House of Taylor. When Elizabeth Taylor launched her first fragrance, Elizabeth Taylor's Passion, more than 20 years ago, even she didn't imagine the sweet smell of success her perfume empire would bring. As fans mourn the international superstar and HIV/AIDS activist, the iconic actress also leaves behind another legacy: She paved the way for stars to translate their fame into profit via endorsed scents. Successful celebrity fragrance lines weren't at all plentiful in 1987 when a news conference was held for Taylor to announce her venture. The idea of her first perfume was met with a bit of skepticism and led The New York Times to ask, "Can Elizabeth Taylor's Passion compete with her friend Calvin Klein's Obsession?" Undergirded by a $10 million marketing campaign that capitalized on the actress's glamour, beauty and allure, the scent was also a reflection of the tastes of Taylor, who was actively involved in its development. "Passion is the ingredient in me that has made me who I am," Taylor was quoted as saying. "It's my passion for life ... my passion for passion that has made me never give up." The success of Passion and Passion for Men led to the release in 1991 of her most successful fragrance: White Diamonds, whose commercial featured Taylor memorably whipping off a diamond earring to toss into a card game with the line, "These have always brought me luck." "Elizabeth Taylor was probably one of the first entrepreneurial celebrities who was able to turn her celebrity into a commercial proposition," Michael O'Connor, a celebrity jewelry stylist and founder of marketing and communications firm Style and Substance, told Portfolio.com. "I don't know of any brand that revolved around the personal positioning in the mind of the consumers in the same way." Over the years, those scents were joined by others in Taylor's line, but the Los Angeles Times reports that White Diamonds continues to be one of the best-selling celebrity fragrances, grossing a remarkable $61.3 million globally in 2010, according to market research firm Euromonitor International. Now, plenty of celebrities have caught a whiff. In fact, having a fragrance line is almost de rigueur for so many stars that it would stink for any celebrity empire not to have endorsed scents as part of its portfolio. Rihanna, Queen Latifah, Paris Hilton and Jessica Simpson have scents manufactured and marketed through Parlux Fragrances. According to Parlux's annual report, sales of Hilton's and Simpson's fragrances accounted for 42% and 15% of the company's $148 million in net sales, respectively, for fiscal year 2010. Last year, singer Mary J. Blige broke records at HSN when her debut fragrance, My Life, sold more than 60,000 bottles and grossed more than $2.7 million. The home shopping channel has also proved profitable for fellow diva Mariah Carey, whose M by Mariah, Mariah Carey Forever, Mariah Carey's Luscious Pink and Mariah Lollipop Bling have raked in millions of HSN sales. Not that the track to celebrity scents was consistent and smooth sailing after Taylor's success. According to a report last year in Forbes, in 2002, Jennifer Lopez reinvigorated the celebrity fragrance landscape when she released the Glow by J.Lo line in partnership with fragrance and beauty company Coty with first-year sales of more than $100 million. "Celebrities like Usher, Antonio Banderas and Gwen Stefani have all successfully followed suit," Forbes said. In 2007, Forbes reported that sales of Britney Spears Curious and Fantasy scents totaled $84 million, while the best-selling fragrance that year, Sean John Unforgivable from Sean "Diddy" Combs, racked in $74.9 million. In February, actress Jennifer Aniston became one of the latest stars to debut a line in the United States with her perfume, Lolavie. "I've always loved to combine different scents to come up with my own unique thing," Aniston told WWD. "One tradition I have with my friends is that when one of us gets married, we have a ton of fragrance oils and pretty bottles at the bachelorette party. Everyone puts a drop or two in a bottle for the bride and makes a wish, and the bride wears our creation on her wedding day." Being a new kid on the block, Aniston may want to wish for just a bit of the magic that surrounded Taylor's venture into the world of perfumes and colognes. Upon the announcement of Taylor's death Wednesday, the company behind her fragrances, Elizabeth Arden, announced that it will continue her legacy. "With the launch of her first fragrance in 1987, Elizabeth Taylor's Passion, she built a fragrance empire and one of the most successful brands in fragrance history," a statement from the company said. "White Diamonds remains a best seller almost 20 years after its 1991 introduction, a testimony to her transcendent and enduring appeal. Our best tribute to Elizabeth Taylor will be to continue the legacy of the brands she created and loved so much."